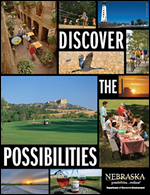 Buffalo County and Kearney, Nebraska offer a complete and compelling package of business and economic development resources. Close to important metropolitan living yet securely wrapped in a safe, welcoming, hometown atmosphere, Kearney is a vibrant university town. The proud communities of Buffalo County provide the alternate life-style inherent and valued in small towns. Kearney is home to a regional-referral medical center and is home to successful manufacturing and processing plants both large and small. Distribution center operations and an array of attractive support services enjoy a labor force that is not only skilled, but possesses the solid Midwest work ethic that is valued and knows how to work. 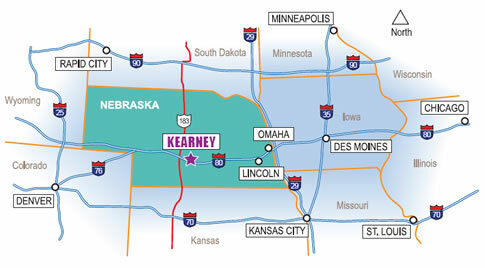 Strategically located on I-80 with convenient access to major markets like Omaha-Lincoln, Denver, Kansas City, Des Moines, Wichita and Cheyenne, Kearney is at the center of a 7-state region and 20 million people. We're ready for your business!